Highly evolved horizontal lathe delivers turning, optional milling and Y-axis capabilities in a compact footprint. Okuma’s new GENOS L3000-M one-saddle lathe is stronger, faster and ideal for cutting a wide range of exotic materials with ease. The integral spindle motor provides increased machining capacity as highly rigid guideways handle powerful cutting capabilities. At IMTS 2016 the GENOS L3000-M will be cutting a steel pinion drive for the automotive industry with Iscar tooling, a member of Partner’s in THINC. The GENOS L3000-M has high speed milling, and Y-axis options on specific models allowing users to select the best specifications for a particular workpiece length and shape. Shop floor productivity is increased with a mounted NC tailstock that allows for easy setup of various workpieces. TAS-C (Thermo Active Stabilizer) construction is standard and automatically compensates thermal effects to maintain tight tolerances. Reduced chip accumulation during long, continuous runs decreases machine downtime for cleaning. 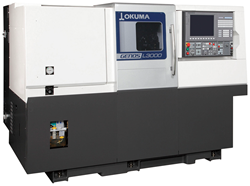 For more information on the GENOS L3000-M visit http://www.okuma.com/genos-l3000-turning-center.